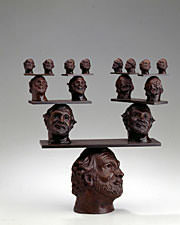 Brian Gross Fine Art is pleased to announce the opening of Robert Arneson’s Self-Portraits in Bronze on March 1, 2012. Known for his profound influence on American art in the second half of the 20th century, this exhibition will feature Arneson’s self-portraiture in bronze. Working in ceramic, bronze, and paper throughout his career, Robert Arneson (1930-1992) worked extensively in bronze for the last twelve years of his life. Using his own image as a means to explore the human condition, Arneson’s bronzes are imbued with his signature wit, satire, and irony. The exhibition will be on view through April 28, 2012. Gary Garrels, in his preface for Robert Arneson: Self-Reflections, SFMOMA (1997), states, “As one of Arneson’s great obsessions, self-portraiture reveals the coherence and the tension of his work. 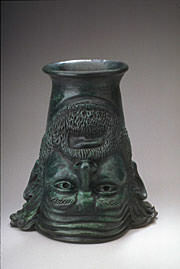 In portrayal of self, Arneson often reached his most playful and inventive forms while opening up the starkest appraisal of his subject.” Creating hundreds of self-portraits throughout his career, the works included in Self-Portraits in Bronze represent his examination of everyday life, art history, politics, and his own mortality. In Bowee Wowee, 1982, Arneson placed his head on the body of a dog, putting himself “in the dog house” surrounded by his own excrement. 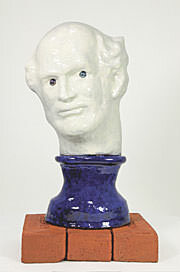 Bowee Wowee is a tongue-in-cheek response to the rejection of Arneson’s tour-de-force, Portrait of George, 1981, a commissioned portrait bust of Mayor George Moscone, that was ultimately rejected by the San Francisco Arts Commission. Bowee Wowee is a witty, self-effacing, and bitingly funny self-portrayal. Starting in the 1990’s, Arneson shifted his focus inward, dealing with issues of mortality. Diagnosed with cancer in 1975, the work produced in the last two years of his life reflects his contemplation of illness, aging, and death. Portrait at 62 Years, 1992, made in the last year of his life, exudes timeless immortality. Placing a ghostly white self-portrait bust on a black column, Portrait at 62 Years is reminiscent of Greek and Roman portraiture. Arneson counted the 62 years of his life with hatch marks on the column in sober precision and simplicity. In the words of Robert Arneson, “I want to make ‘high’ art that is outrageous while revealing the human condition which is not always so high.”* Self-Portraits in Bronze showcases Arneson’s use of self-portraiture as a mode for examining human existence. Robert Arneson, his life and work, will be the focus of a monograph, A Troublesome Subject: The Art of Robert Arneson, by Jonathan D. Fineberg, PhD., Professor Emeritus, University of Illinois at Urbana-Champaign. The book will be released by UC Press in early Spring 2013. The Addison Gallery of American Art, Andover, MA, is organizing Robert Arneson: Artists, Heroes, and Other Strange Types, a thematic retrospective, to open Spring 2015, with subsequent tour. Independent scholar Joan Simon is guest curator of the exhibition, the first large-scale touring show of Arneson's work in 20 years. Robert Arneson was born in Benicia, California in 1930. He received an MFA in 1958 from Mills College in Oakland. A professor of art at the University of California at Davis for 29 years, he retired in 1991, and died in 1992. Robert Arneson: A Retrospective was organized by Des Moines Art Center in 1986, which traveled to the Hirshhorn Museum and Sculpture Garden, Washington, D.C., the Portland Art Museum, Oregon and the Oakland Museum of Art, California. 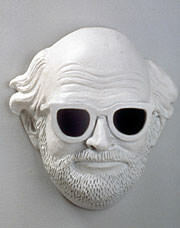 The retrospective, Robert Arneson, was held at the Museum of Contemporary Art, Chicago in 1974. 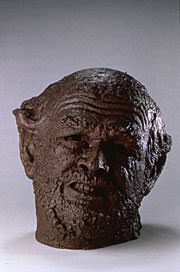 The San Francisco Museum of Modern Art mounted Robert Arneson: Self-Reflections in 1997. 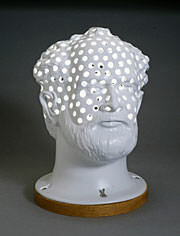 Additionally, his work was featured in Visual Politics: The Art of Engagement, San Jose Museum of Art, California, 2006; Arneson and the Object, Palmer Museum of Art, The Pennsylvania State University, 2004; Big Idea: The Maquettes of Robert Arneson, Palo Alto Art Center, California, 2002; Arneson and Politics: A Commemorative Exhibition, M.H. de Young Memorial Museum, San Francisco, 1993; Ceramic Sculpture: Six Artists, Whitney Museum of American Art, New York, 1981; and West Coast Ceramics, Stedelijk Museum, Amsterdam, 1979. His work can be found in major museums nationally and internationally.